Line Pressure Test Procedure 1. Inspect the amount of engine oil and replenish if necessary. 2. Drive the car for about 10 minutes to warm it up so that the CVT fluid reaches in the range of 50 to 80°C (122 to 176°F), then inspect the amount of CVT fluid and replenish if necessary. The CVT fluid temperature rises in the range of 50 to 80°C (122 to 176°F) during 10 minutes of driving. 3. After warming up CVT, remove the oil pressure detection plug and install the joint pipe adapter (SST: KV31103600) (A), adapter (SST: 25054000) (B), oil pressure gauge set (commercial service tool) (C). When using the oil pressure gauge, be sure to use the Oring attached to the oil pressure detection plug. 4. Securely engage the parking brake so that the tires do not turn. 5. Start the engine, and then measure the line pressure at both idle and the stall speed. • Keep the brake pedal pressed all the way down during measurement. • When measuring the line pressure at the stall speed, refer to TM-186, "Inspection and Judgment". 6. 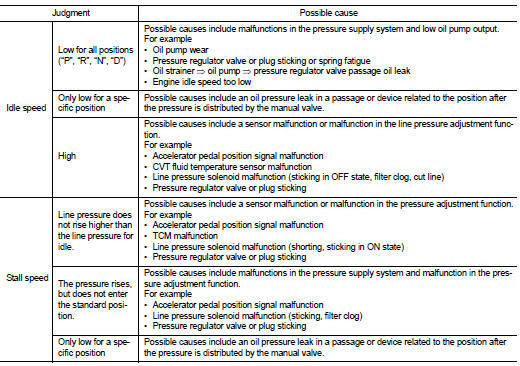 After the measurements are complete, install the oil pressure detection plug and tighten to the specified torque below. • Apply CVT fluid to O-ring.